Russ Swanson always encouraged me, no matter what my interests were. To this day I enjoy talking with him about his classes and his FFA activities. His teachings in class and with FFA helped me with every job skill I have today. If I could, I would encourage every student in Canton High School to take his class. Even if they choose not to go into agriculture. His teachings will help with all of life's challenges. Palmer Eidet recognized hidden talents and encouraged his students an dmembers to develop them. He taught how efficiency and honesty could be recognized no matter what you choose to do. Had Jerome Nolz all 4 years of High School and he was a great teacher, and very focused. He retired a few years ago. I am a 90 year old descendent of the FFA of Wessington Springs, SD. We had a very different teacher who helped with projects and enaything else we needed on the farm or school. Mr. Carey showed me what a great organization the FFA was and made me want to become more involved. Today I am teaching agriculture and serving as an FFA advisor, and I don't think I would have made that decision to pursue Ag Ed as a career if it hadn't been for being an FFA member. "I would say Levi Wade was probably the most influential high school and/or college instructor I have ever had. He provided wisdom and development of my personal leadership skills without me knowing it at the time. Very knowledgable, respectful, and he always guided, never controlled. I think of him alot." 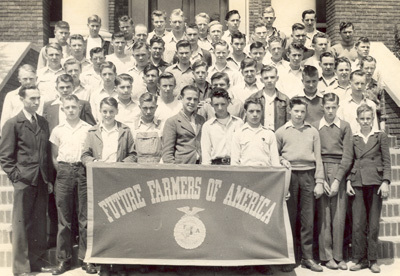 "Mr. Vigness had an ability to identify and encourage members of the FFA who could do well. Without appearing to push he led his students to excel in the projects and contests. Like so many FFA advisors he was an advocate of education and sought greater challenges to benefit students and the agricultural community. He was one of the primary movers in consolidating schools in this area while simultaneously becoming the school's superintendent." "I was the 2nd American Farmer from Groton. I just retired from 60 years of Red Angus. I finally got FFA back in Groton as we didn't have it for about 15 years." "My advisor, Mr. Kleinsasser was a '2nd Dad' to me! His encouragement has been much appreciated!" "During my years in FFA at Menno, SD, Jeff Buechler was my advisor - he was a great advisor. At the time when I was in FFA there were not a lot of girls in FFA. He always lifted my spirits to do well and always made FFA enjoyable. FFA gave mea lot of leadership skills and confidence to do well in life. We did well in Parli Pro contests and other things as well. My son and daughter are in FFA. My son is graduated now, but my daughter enjoys FFA and socializing with other members as well." "Freddie Jefferson encouraged an insecure boy from a single parent home that he could overcome any obstacle in life. Three years later, that young man was elected State Reporter for the Louisiana Association FFA." nominated by Thomas Smotherman, Jr.
"Ernest Christensen was our Vocational Ag instructor at Webster High School in the 1940's and 1950's, a gentleman educator of 'exceptional' ambition, effectiveness as a teacher, knowledge of an extremely broad curriculum, devotion toward effectiveness and personal sacrifice for effective learning by students during the school year and on student projects during summer..."
"My father was not an outspoken individual, but the one award that he cherished was his State Farmer degree that he received in 1964 thanks to Mr. Clarence Grebner. As a 1st year ag instructor, his deep & commanding voice caught the respect of my father and the two seemed to work well together as an ag advisor and chapter president should. 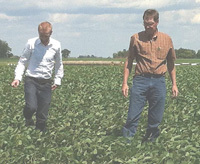 With Mr. Grebner's guidance, Dale earned his State Farmer Degree in 1964. As with many parents, most of the plaque's on my parents wall are a shrine to their children's accomplishments. We lost dad this past winter due to a long battle with depression. His state farmer plaque always has and always will hang their in his bedroom with pride for years to come." "'Gus' was an inspiration to me all through high school. He pushed me to get me involved in FFA and is very likely the main person involved in seeing that I went to college, which I did at SDSU. He made sure I went out for public speaking (finished 2nd)in the state contest, was awarded the "State Farmer" degree and became State Treasurer form 1949-50. After graduation I went on to a 37 year successful career with DuPont in Ag Chem." "He told my folks that he would get me to go on to college and he would try to get me into ag. He managed to get me to visit with Dr. Clark Hanson,SDSU Ag Ed Prof who is to this day a good friend and advisor, about becoming an educator. Mr. Hall got the job done, I became an ag teacher. Doc was his nickname and it fit. Doc recently passed away but he never quit being my advisor. The really good part is this, I was not the only one who received encouragement,and guidance during the course of our careers as I found this out at his funeral." "Mr. Ollila provided a firm foundation for student success. He had a way of pushing you to success without being over-bearing or pushy! I respected Mr. O's ability to find the strength in every student at Newell High School! Was he perfect - no, but who is, and I would not trade him or the experiences I had with him for anything!" "Alan Fenner was my FFA advisor in Freeman during the early 1980's. He was an excellent classroom teacher where I learned about construction and record keeping and how to overhaul an engine. As an FFA advisor he was a coach and an encourager, eventually convincing me to try for the American Farmer Degree, which is still hanging on my office wall 30 years later. He not only taught and encouraged me, but also was a role model to all of us." "Marlowe's influence kept me on the straight and narrow, coaching us to many state and national awards. Two of us graduated form SDSU and another farmed successfully. Marlowe was a very positive and encouraging force."